Company services present a variety of advantages which help partners to organize stable, favorable business in their country or region. • Real support from the central office before opening of business throughout entire contract validity period. • Free granting of the web site completely filled with the information on the offered goods, with possibility to add in the Internet shop of the accompanying goods. The web site is made in English with possibility of addition of the second language. We give an access to the administrative panel of the site and within several days we help to translate a site to your language. By the end of the first week you receive completely a ready site for clients from all country. Possibility of creation of the corporate mail, special protection of servers of corporate mail against breaking. 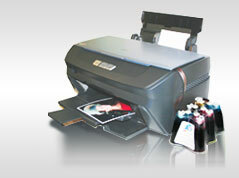 • Videoclips on installation of CISS on the most popular models of printers. • Very favourable wholesale prices for partners (400 % of profitability from the purchase price). Our experts will teachyou to serve not only production INKSYSTEM, but also printing systems Epson, Canon, HP and Brother that will bring to you an additional revenue from office equipment repair.